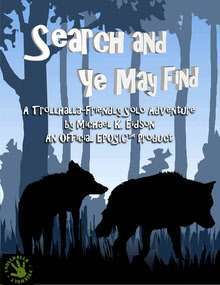 Treasure awaits you in this first Trollhalla-friendly mini-solo from Eposic. It is better to be lucky than good in this adventure, which could significantly beef up even the weakest character, or be the downfall of even the strongest. Intended for use with either the 5.x or 7.x Tunnels and Trolls rules. All kindreds and character types allowed, as well as missile weapons and combat spells. Active links in the PDF! Grayscale and color versions both included for one low price! This title was added to our catalog on October 15, 2011.